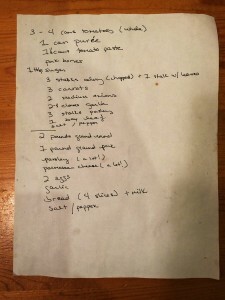 The remarkably stain-free recipe copied down by Lucia years ago. I say we follow this “as faithfully as possible” because we don’t have a true recipe for it. What we have is more a list of ingredients, not quite listed in the order you are meant to add them into the bowl or pot, and not much in the way of cooking instructions. Like all the best family recipes, this is more about sitting around together, chatting away while you chop some parsley or grate some cheese, and mixing and simmering until things are just so. 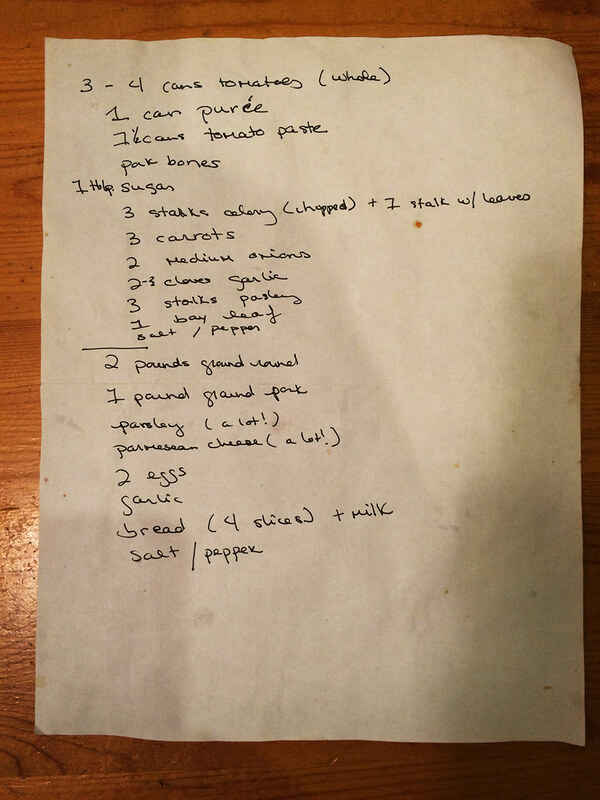 But, since you’re not sitting around our table while we’re chopping away, I’ll attempt to specify things a bit more than that original sheet of paper we have, with a few small changes here and there at the risk of inciting the ire of Nona. Generally speaking, the sauce is made more hardy with some additional veggies, and the meatballs are drop-style, so there’s no messy frying involved. The sausage is optional, but is sausage ever really optional? Aside from that big plate of carbs, this practically passes for health food nowadays in our household. This one is not a meal to start on a weeknight, but the recipe easily makes four or five dinners and maybe a lunch or two. Save a few hours on a Saturday to make this one, or start early on a Sunday morning—the sauce benefits from a rest so that all the flavors marry, and you can have your first meal for a proper Sunday supper, Brooklyn style. This recipe also freezes well for another couple of meals in the near future (see notes on freezing in the instructions). For the sauce: warm a heavy-bottomed 8-qt pot over medium heat. Add the olive oil, onions, and kosher salt. Cook the onions for five minutes, until translucent, stirring occasionally. Next add the minced garlic, carrots, and celery, and cook for another five minutes, stirring occasionally. Add the crushed red pepper and tomato paste and cook for five minutes more, stirring occasionally. You are trying to get this mix almost caramelized. Finally, add the canned tomatoes, pork bones (or ribs), and the bay leaves. Bring this up to a simmer and reduce heat to low. Give it a good stir every 20 minutes or so—a bit more often towards the end of the cooking process, which should last 2-1/2 to 3 hours. After an hour of cooking, taste the sauce—obviously you're not looking to make candy here but if you think it could use the optional sugar, go ahead and add it in. For the meatballs: Chop the bread slices small (or give them a pulse in a food processor). Put the crumbs in a bowl along with the milk and allow them to soak. In a larger bowl, combine the beef, pork, garlic, parsley, cheese, salt, and black pepper, and combine until mixed. Give the bread slush a gentle squeeze and add them to the mix (you might have some milk left in the bowl), along with the three eggs. Mix until just combined. The less you mix at this stage the fluffier your meatballs. You can refrigerate this mix for up to 2 hours if you start making it after you've added the last ingredients in the sauce step. After the sauce has cooked for around 2 hours, remove the pork bones and fish out the bay leaves from the sauce. Pick the meat off the bones and enjoy as a snack (or if you are using ribs, they can be a leftovers lunch meal in themselves!). The pork meat is also your best indication if you need to adjust the seasoning of the sauce now with a bit more salt. Form the meatball mix into 2" balls. Drop each ball into the simmering sauce. You should be able to make around 32 of them. Once the sauce is back to a simmer, the meatballs need to cook around 30 more minutes. Again, give the sauce a stir every once in a while, to ensure that the bottom of the pot isn't burning. If you are making the sausage: par-cook the sausage under a broiler until the outsides are browned, around 10 to 15 minutes per side. 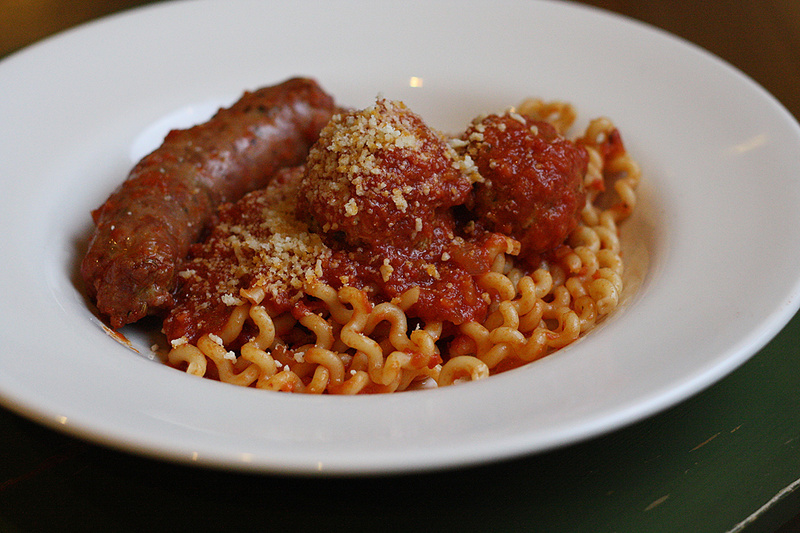 You can add the par cooked sausage to the sauce after the last meatball has been added to the pot. To serve: as mentioned in the post, this sauce benefits from a rest—cook it the day before or early the morning of the meal, and allow it to cool (see additional notes on this). Bring a large pot of well-salted water to a boil, and cook your pasta of choice as directed by the package instructions. After draining, add the pasta back into a pot with a few ladles of the sauce. Serve out portions of the pasta, a half (or full) piece of sausage, and two meatballs per portion (one for kids), and top with some additional parmesan. * Lucia would like me to note that she strongly disagrees with my use of crushed red pepper here. Use black pepper if you prefer. For the meatballs, try to use slightly stale bread. We often use half a loaf of Italian bread (with the crust removed) as an equivalent. To save and freeze: after the initial cook, separate the meatballs and sausage into one or two large storage containers, and the sauce into separate storage containers. We usually keep it like this for a few days, but you can safely freeze half of the meatballs/sausage in freezer bags, and half the sauce in appropriate containers at this point, in order to enjoy this meal again without all the prep. Just cook up another pound of pasta for rounds 3 and 4! Spelled so the kids can pronounce it. Lucia is absolutely right about the red pepper flakes. Heretical! Nona gives it a no-no, but Mike IS a pretty good cook and he captures what this wonderful meal means to all of us. Finally, the secret recipe revealed! Can’t wait to try it! Cooking wholesome, mostly healthy food for our family of four and trying to get the kids to eat it. It doesn't always work out.